With a professional eye, we’ll make sure that your logo is high-quality, professional, attention-grabbing, and unique. There are countless companies out there creating marketing campaigns every day. In a sea of ineffective, lackluster logo design, you want your brand to stand out from the crowd. But how do you ensure that your logo is high-quality, professional, attention-grabbing, and unique? What should your priorities be when it comes to designing your company’s logo? We’ve got you covered with some helpful tips for making sure your logo stands out. Here are four major ways to set your logo apart. Many logos make an impact through their aesthetic appeal, which partly relies on how well they are designed to follow artistic principles of proportion and symmetry. This will help your branding remain focused, communicative, and appealing. These are important reasons to consult design professionals when it comes to your marketing. 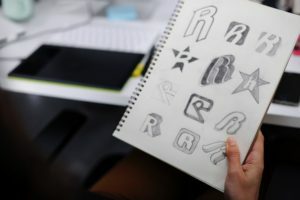 When it comes to drafting up a logo, a design professional will typically give you several color options. You’ll want your marketing to look right in multiple formats, whether you’ll be using commercial graphics, vinyl decals, or other promotional materials. Color sends a message just as the design does on its own. You’ll want your logo’s color palette to fit your business’s marketing strategy and communicate your brand. A logo design professional will make sure your logo looks good in color and grayscale alike. It’s tempting to design a logo using complex illustration and unique typography. But at the end of the day, this isn’t what designing a unique and effective logo is about. Some of the most recognizable logos we see each day are simple: an apple, for example. Sometimes, the simplest designs are the most iconic. Make sure that your logo stands out by keeping it simple and recognizable. A great way to set your logo apart is with negative space. By using the negative space in your logo, you can make the most of your design. You can even add double meaning to your logo using a design that appears as one image in color and another in negative space. These clever touches will make your logo memorable. Think of the FedEx logo–the iconic arrow seen in the negative space makes this logo memorable, clever, and instantly recognizable. It helps to drive the business’s message home. Our goal is to exceed your expectations and produce effective custom signage that helps you promote your company’s image, attracts new customers, delivers your message, and gives your corporate image a creative edge. Follow us on Facebook! This entry was posted on Friday, February 8th, 2019 at 3:56 pm. Both comments and pings are currently closed.